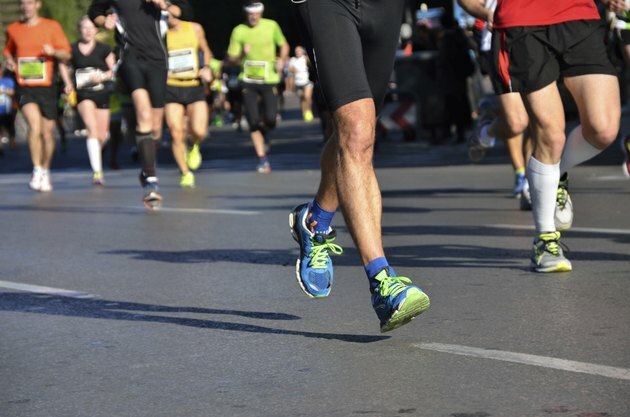 You've been training for months for your half-marathon, and are excited and eager for the big day. You've even been paying close attention to your diet to improve your workouts and your race. You've been eating right all along, but if you want to perform your best on race day, you need to make a few modifications to your usual diet a few days before the race so that your muscles have the energy they need to run those 13.1 miles. Two days before the half-marathon your goal is to store as much energy in your muscles as possible. As your body's primary source of fuel, carbs should be the focus of your meals. When carb-loading two days before the race, 70 percent of your calories should come from carbohydrates, according to the Colorado State University Extension. Healthy carb choices include grains such as bread, pasta and rice, as well as fruits, vegetables and beans. Two days before the race you might enjoy a high-carb breakfast meal that includes a whole-wheat bagel topped with peanut butter and sliced banana, served with yogurt and a cup of orange juice. For lunch, you might enjoy grilled chicken with a large baked potato, peas, an apple and a cup of milk. A high-carb dinner meal might include whole-wheat spaghetti tossed with cooked shrimp, broccoli, cauliflower, carrots and Parmesan cheese with a slice of Italian bread and a wedge of fresh watermelon. You want to continue your high-carb diet the day before the race. To prevent discomfort and indigestion during your half-marathon, stick with carbs that you've been eating all along. Additionally, your dinner meal should be low in fat and fiber to prevent abdominal cramping during your race. And, don't forget to drink water. Starting your race well-hydrated is as important as loading up on carbs, according to the Academy of Nutrition and Dietetics. Drink enough water so that your urine turns straw color. You should eat your last meal three to four hours before you start your half-marathon. This meal should be high in carbs and low in fat, and contain 500 to 1,000 calories. Choose carbs that take a little longer to digest, such as bread, cereal, fruits or vegetables, so you have a steady source of energy when running. A good pre-half-marathon meal might include lean turkey stuffed into a pita with a banana. Continue to drink water up until 30 minutes before your half-marathon begins.